i hope it gets discontinued so the values in the future might increase similar to the 93+ toyota supra. it would become more rare.. Same here, and I'm one who usually always de-badges everything. I appreciate how minimal and clean its badging is. I don't like "V6 TURBO" on the sides of cars and love how it doesn't have any badge denoting what's under the hood (unless you know that "GT" means the 3.3L TT option). I like how there are just three badges (besides KIA) on the back, Stinger, GT, and AWD. That's all there needs to be and says everything it needs to say. It's very clean. I love the font of KIA and am proud to drive a high-quality Korean car. 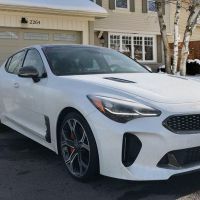 I would remove the Stinger, GT, and AWD badges before the KIA emblems. The "E" badges look cool, but I don't want to come across as being "ashamed" of the original KIA badges. I'm not just a fan of my Stinger, but I'm a KIA fan too.